It’s National Park Week, and even though I was mildly traumatized in one as a kid, I still love the parks. I was nine and just completed the third grade. Our family of six did the cross-country camping thing during summer vacation. Dad converted our ’65 Volkswagen Microbus into a camping wagon, replacing the middle seat with a side seat so we kids could look at each other and play games while on the road. People didn’t wear seatbelts back then. We were used to being thrown around the car whenever it swerved or if Dad had to slam on the brakes. It was part of toughening us up and another way to promote togetherness. 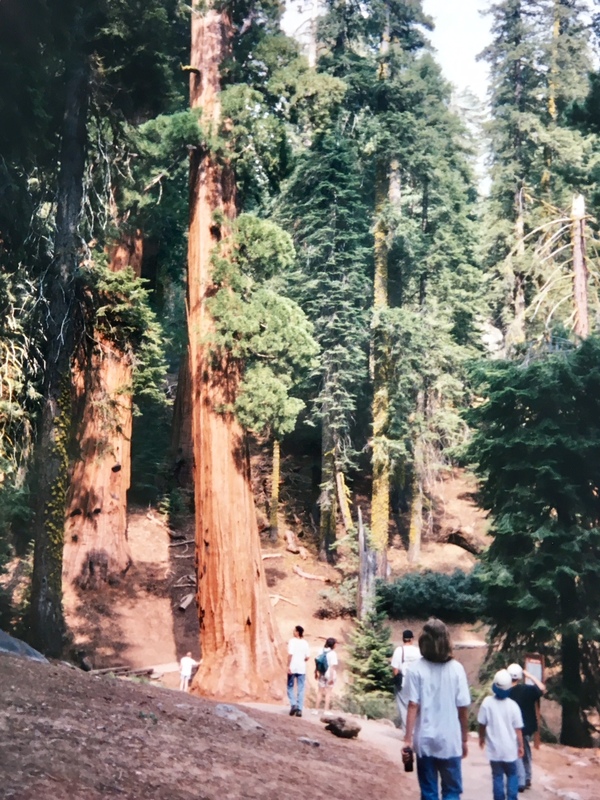 It happened in Sequoia National Park in California. My dad and brother always pitched the three-room tent and my two sisters and I would help Mom by getting water, brushing off the picnic tables, and the like. Our campground had a nice fire pit area to cook on and warm ourselves by in the cool night air. The woods were amazing. Those trees! Well, their majesty even awed a young girl like me. One of the cardinal rules of camping is: use the outhouse before you turn in for the night. Another rule of camping with children is: they don’t always follow the rules. We had barely snuggled down in our sleeping bags when I regretted my decision not to use the bathroom right before bed. I mean, I had just gone thirty minutes earlier and it was a little hike down to the outhouse. I knew I’d be fine. Except I wasn’t. Dad asked me if I remembered where the outhouse was and I said I did. We obviously didn’t yet know that I was directionally challenged since I had never put that lack-of-skill set to the test. He handed me a flashlight and turned me loose in the darkness. Now, I can only imagine that my parents had quite the argument over this after my mom woke up, but meanwhile there I was standing outside of the tent armed with a flashlight and a full bladder, all by myself. I was petrified. I walked a few feet away from the tent and stood there in the black of night. There was no way I was going alone (so to speak). He solved that by handing me a second flashlight. To this day I don’t know what he was thinking, but I mustered the courage to walk down the road in the direction of the outhouse. Only I never came upon the outhouse. Who knows – maybe I was close, but I couldn’t find it. I backtracked my steps and told Dad the bad news. I was sure he would come out and lead me there, but instead he forgot I was a girl and told me to go out behind the campsite. At this point I was practically scared peeless (is that a word? ), but I figured if I didn’t take care of things I’d be in big trouble, so I managed. Yuck! No sooner had I zipped up my sleeping bag when we heard a horrible sound. It was like someone was taking a crowbar and beating our van to pieces. That woke my mom up! All six of us peered out of the tent to witness an enormous bear throwing garbage cans around our campsite like they were confetti. Needless to say, it was a good thing that I had emptied my bladder or else I would have right then. That was my first close encounter with a bear and my last time going to bed without visiting the outhouse. I believe two things happened that night. Number One. And, my unhealthy fascination with bears was born. I guess a third thing happened too, but I never did hear the argument between my mom and dad. So, Happy National Park Week. Get out there and explore. Bob and I are heading to Utah on Saturday to do just that. I’ll keep you posted. By the way, I will not have to worry about outhouses at night anymore. No more tent camping for us! 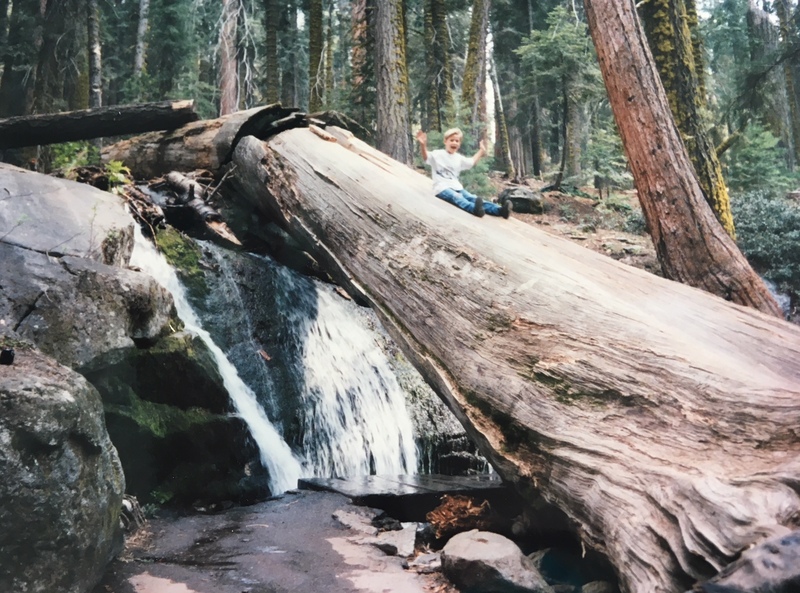 My eight-year-old son enjoying Sequoia National Park when Bob and I took the kids across country in 1995. I’ve camped enough now.